Your golden years can also be your chrome years. There is a saying in the motorcycle community, “You don’t quit riding because you get old, you get old because you quit riding.” That may be one of a multitude of reasons why, more and more, you see grey locks peeking out from under those motorcycle helmets as they roar by. Some are new to it, but most have carried the motorcycling hobby into their retirement. The average age of a motorcycle licence holder in North America is 51 years old. That means there are as many riders past that age as there are from 14 to 50. 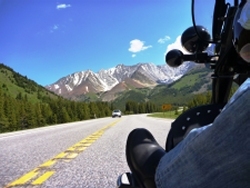 There are about three million motorcycle riders in Canada. I’m bad at math, but I calculate that means there are roughly a million riders who have seen 60 birthdays. That’s more than the population of Ottawa, slightly less than Calgary’s. Can that many people lose control of their faculties all at one time? Apparently so. The proof, at least in Calgary where I live, is at the coffee shops in Bragg Creek on any spring, summer or autumn weekend. A few hundred motorcycles come and go from there every Saturday or Sunday. And a high number of those riders, when they pull their helmets off, have grey hair (if they have any hair at all.) The same scene is repeated in the small towns around Toronto, north and south of Montreal, at the roadside lobster roll stands in the Maritimes, in the truck stops near Winnipeg and up the Sea-to-Sky Highway north of Vancouver. So what, beside 90 octane gasoline, is fueling this movement? What would cause an otherwise sane and rational person to hop on a high powered vehicle that can’t stand up by itself and careen down the highway at break-neck speed, all the while avoiding larger, armour-clad vehicles that seem bent on turning them into road kill? Does that sound like any way to spend your golden years? Well, about a million people would respond, “It sure as hell is.” This is not your grandmother’s rocking chair. Today’s retirees are younger, more affluent, healthier and active. Most are of Baby Boomer vintage which means they came of age in the heyday of rock and roll, hot rods and, you guessed it, motorcycles. Which brings me to the loose association of motorcycle aficionados I hang around with – the Foothills Retreads. They are the Southern Alberta chapter of Retreads International, a motorcycle club founded just after World War II by returning soldiers who, the legend goes, were looking for the companionship and adrenaline they found overseas. For the record, Retreads are not THAT KIND of motorcycle club. Police wave at us and Japanese tourists visiting Banff ask to have their photos taken sitting on our bikes. Almost anyone who rides or who would like to ride can be a member. Spouses, or other similarly responsible adults, are automatically members. The brand of bike you ride doesn’t matter, although there is a lot of good-natured teasing about bike choices and the relative merits of American versus Japanese versus European manufacturers. Discussions about the right motor oil have raged on for years. Retreads do have one inviolate rule – no members under the age of 40. The club crest sports the Roman numerals XL – that’s 40, for those who don’t speak Latin – as a reminder. Some say it is to give us time to ourselves in grace and dignity among our age peers. Other says it prevents our kids from seeing what we get up to on weekends. Great review! 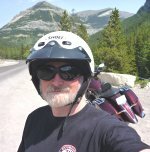 As a member of the Foothills Chapter in southern Alberta Canada for over 10 years it’s been a wonderful experience and have thoroughly enjoyed it!